In mid-November, 2013 Wayne County Gem and Mineral Club member Linda Schmidtgall and her husband Les made one last collecting trip before winter. And they were smart: they pointed their fossil hauling Chevy pickup south and travelled to north central Tennessee to hook up with the Knoxville Gem and Mineral Society and the Georgia Mineral Society on their annual fall crinoid and coral “harvest”. 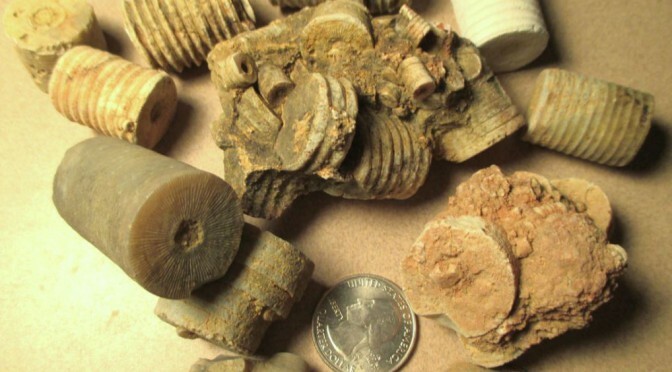 Fossil hunting along the shorelines of the Tennessee and Kentucky lakes is best when the water level is lowest in late fall and crinoid fossil remnants can be collected by the bucket full. Stem sections, or cemented crinoidal hash locally referred to as crinoidal plates, can be collected along the shoreline or just below the water line. All are fully silicified into grey or light bluish chalcedonic chert.